Posted on April 16th, 2011 in Events. No Comments. “Visions: Real & Imagined,” an innovative exhibition of works by Elle Schorr of Lake Worth, Florida and Nathan Selikoff of Orlando, Florida explores two wildly different approaches to capturing and portraying the complex world surrounding us. This unique exhibition juxtaposes complex photographic images of real city life as seen by Elle Schorr with imaginative and abstract computer generated imagery by Nathan Selikoff. 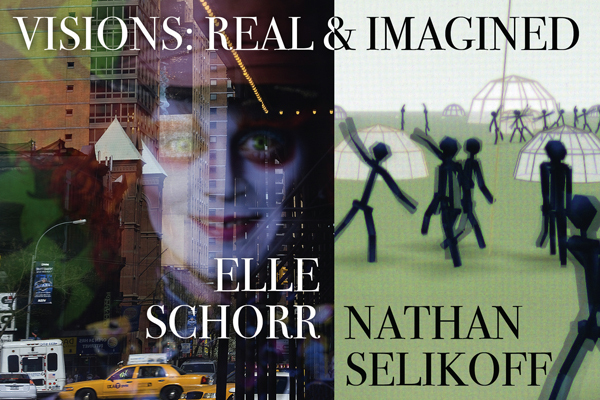 Both present representations of the world around us: Schorr’s based on reality as seen through her camera, Sellikoff’s based on the underlying, and unseen, realities of science and math as imagined through his computer. The exhibition opens in Palm Beach Gardens City Hall, on Monday, May 9, 2011, with an reception on Wednesday, May 11, from 6 to 8 PM. The exhibition, part of Palm Beach Gardens’ GardensArt program, will continue through June 23. Palm Beach Gardens City Hall is located at 10500 North Military Trail, Palm Beach Gardens, FL, 33410. Exhibition hours are Monday to Friday, 8 AM to 5 PM. Elle Schorr’s photographs are reflections taken on city streets, and explore the intersections of past and present, old and new, shadow and light as captured by her camera in real time. She seeks out the cacophony of city life, looking for a fuller experience of the streets, the neighborhoods, the mood, the changes in lifestyles and eras in which the city was built. At times, her images become mysterious, even magical. They are of real life, but often not realistic, nor literal. Schorr’s work has been exhibited in numerous juried exhibitions throughout Palm Beach County, including “All Florida” at the Boca Raton Museum of Art, “Visual Conceits” and “New*Art” at the Armory Art Center, and “Contempo” at the Lighthouse ArtCenter. A selection of her work can be seen at Liman Gallery in Palm Beach. More of Schorr’s work can be seen on her web site www.elleschorrphotography.com. Nathan Selikoff’s explorations take place in the fuzzy overlap between art, mathematics and programming, transforming the non-visual reality of equations and systems into abstract imagery in the form of prints, animations, and installations. Using the computer as his primary artistic tool and pulling from such diverse areas as chaos and population simulation, Selikoff mixes mathematics with traditional elements of design to create experimental cutting edge art. Selikoff’s award-winning artwork has been exhibited in galleries and venues throughout the United States and around the world, including Art Basel in Switzerland; Bridges Conferences in Hungary, Canada and the Netherlands; the Maitland Art Center in Florida; AXIOM Gallery in Boston; the Los Angeles Center for Digital Art; and SIGGRAPH Art Galleries. He recently had a solo exhibition at Palm Beach State College’s Eissey Campus Gallery. His work can be seen at nathanselikoff.com.